This article is about the weapon. For other uses, see Crossbow (disambiguation). A crossbow is a type of elastic ranged weapon in similar principle to a bow, consisting of a bow-like assembly called a prod, mounted horizontally on a main frame called a tiller, which is handheld in a similar fashion to the stock of a long gun. It shoots arrow-like projectiles called bolts or quarrels. The medieval European crossbow was called by many other names including crossbow itself, most of which were derived from the word ballista, an ancient Greek torsion siege engine similar in appearance. Although having the same launch principle, crossbows differ from bows in that a bow's draw must be maintained manually by the archer pulling the bowstring with fingers, arm and back muscles and holding that same form in order to aim (which demands significant physical strength and stamina), while a crossbow uses a locking mechanism to maintain the draw, limiting the shooter's exertion to only pulling the string into lock and then release the shot via depressing a lever/trigger. This not only enables a crossbowman to handle stronger draw weight, but also hold for longer with significant less physical strain, thus capable of better precision. Historically, crossbows played a significant role in the warfare of East Asia and Medieval Europe. The earliest crossbows in the world were invented in ancient China and caused a major shift in the role of projectile weaponry. The traditional bow and arrow had long been a specialized weapon that required considerable training, physical strength and expertise to operate with any degree of practical efficiency. In many cultures, archers were considered a separate and superior warrior caste, despite usually being drawn from the common class, as their archery skill-set was essentially trained and strengthened from birth (similar to many horseman cultures) and was impossible to reproduce outside a pre-established cultural tradition, which many nations lacked. In contrast, the crossbow was the first ranged weapon to be simple, cheap and physically undemanding enough to be operated by large numbers of untrained conscript soldiers, thus enabling virtually any nation to field a potent force of crossbowmen with little expense beyond the cost of the weapons themselves. In modern times, crossbows, like bows, have been largely supplanted by the more powerful and accurate firearms in most weapon roles, but are still widely used for competitive shooting sports, hunting and scenarios when shooting with relative silence is important. A crossbowman or crossbow-maker is sometimes called an arbalist or arbalest. Arrow, bolt and quarrel are all suitable terms for crossbow projectiles. The lath, also called the prod, is the bow of the crossbow. According to W.F. Peterson, the prod came into usage in the 19th century as a result of mistranslating rodd in a 16th century list of crossbow effects. The stock is the wooden body on which the bow is mounted, although the medieval tiller is also used. The lock refers to the release mechanism, including the string, sears, trigger lever, and housing. A crossbow is essentially a bow mounted on an elongated frame (called a tiller or stock) with a built-in mechanism that holds the drawn bow string, as well as a trigger mechanism that allows the string to be released. The Chinese trigger mechanism was a vertical lever composed of four bronze pieces secured together by two bronze rods. The nu [crossbow] is so called because it spreads abroad an aura of rage [nu]. Its stock is like the arm of a man, therefore it is called bi. That which hooks the bowstring is called ya, for indeed it is like teeth. The part round about the teeth [i.e. the housing box] is called the 'outer wall' [guo], since it surrounds the lug [gui] of the teeth [i.e. the nut]. Within [and below] there is the 'hanging knife' [xuan dao] [i.e. the trigger] so called because it looks like one. The whole assembly is called ji, for it is just as ingenious as the loom. The earliest European designs featured a transverse slot in the top surface of the frame, down into which the string was placed. To shoot this design, a vertical rod is thrust up through a hole in the bottom of the notch, forcing the string out. This rod is usually attached perpendicular to a rear-facing lever called a tickler. A later design implemented a rolling cylindrical pawl called a nut to retain the string. This nut has a perpendicular centre slot for the bolt, and an intersecting axial slot for the string, along with a lower face or slot against which the internal trigger sits. They often also have some form of strengthening internal sear or trigger face, usually of metal. These roller nuts were either free-floating in their close-fitting hole across the stock, tied in with a binding of sinew or other strong cording; or mounted on a metal axle or pins. Removable or integral plates of wood, ivory, or metal on the sides of the stock kept the nut in place laterally. Nuts were made of antler, bone, or metal. Bows could be kept taut and ready to shoot for some time with little physical straining, allowing crossbowmen to aim better without fatiguing. Chinese crossbow bows were made of composite material from the start. European crossbows from the 10th to 12th centuries used wood for the bow, also called the prod or lath, which tended to be ash or yew. Composite bows started appearing in Europe during the 13th century and could be made from layers of different material, often wood, horn, and sinew glued together and bound with animal tendon. These composite bows made of several layers are much stronger and more efficient in releasing energy than simple wooden bows. As steel became more widely available in Europe around the 14th century, steel prods came into use. Traditionally, the prod was often lashed to the stock with rope, whipcord, or other strong cording. This cording is called the bridle. The Chinese used winches for large mounted crossbows. Winches may have been used for hand held crossbows during the Han dynasty but there is only one known depiction of it. The Wujing Zongyao mentions types of crossbows using winch mechanisms, but it's not known if these were handheld crossbows or mounted crossbows. During the medieval period, both Chinese and European crossbows used stirrups as well as belt hooks. In the 13th century European crossbows started using winches, and from the 14th century an assortment of spanning mechanisms such as winch pulleys, cord pulleys, gaffles, cranequins, and even screws. 15th-century Wallarmbrust, a heavy crossbow used for siege defense. Earliest European depiction of cavalry using crossbows, from the Catalan manuscript Four Horsemen of the Apocalypse, 1086. 16th-century French mounted crossbowman (cranequinier). His crossbow is drawn with a rack-and-pinion cranequin, so it can be used while riding. Pistol crossbow for home recreational shooting. Made by Frédéric Siber in Morges, early 19th century. On display at Morges military museum. The arrow-like projectiles of a crossbow are called crossbow bolts. These are much shorter than arrows, but can be several times heavier. There is an optimum weight for bolts to achieve maximum kinetic energy, which varies depending on the strength and characteristics of the crossbow, but most could pass through common mail. In ancient times, the bolts of a strong crossbow were usually several times heavier than arrows. Modern bolts are stamped with a proof mark to ensure their consistent weight. Bolts do not have fletching, i.e. feathered ends like those commonly seen on arrows. Crossbow bolts can be fitted with a variety of heads, some with sickle-shaped heads to cut rope or rigging; but the most common today is a four-sided point called a quarrel. A highly specialized type of bolt is employed to collect blubber biopsy samples used in biology research. Most modern crossbow hunters incorrectly refer to the bolts as arrows, due to the similar appearance, but the physics of how a bolt finds its target is different from that of an arrow used in a vertical bow. Even relatively small differences in arrow weight can have a considerable impact on its drop and, conversely, its flight trajectory. The ancient Chinese crossbow often included a metal (i.e. bronze or steel) grid serving as iron sights. Modern crossbow sights often use similar technology to modern firearm sights, such as red dot sights and telescopic sights. Many crossbow scopes feature multiple crosshairs to compensate for the significant effects of gravity over different ranges. In most cases, a newly bought crossbow will need to be sighted for accurate shooting. 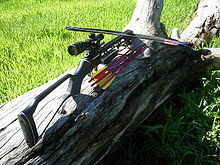 A major cause of the sound of shooting a crossbow is vibration of various components. Crossbow silencers are multiple components placed on high vibration parts, such as the string and limbs, to dampen vibration and suppress the sound of loosing the bolt. A miniature guard wielding a handheld crossbow from the top balcony of a model watchtower, made of glazed earthenware during the Eastern Han era (25–220 AD) of China, from the Metropolitan Museum of Art. In terms of archaeological evidence, crossbow locks made of cast bronze have been found in China dating to around 650 BC. They have also been found in Tombs 3 and 12 at Qufu, Shandong, previously the capital of Lu, and date to 6th century BC. Bronze crossbow bolts dating from the mid-5th century BC have been found at a Chu burial site in Yutaishan, Jiangling County, Hubei Province. Other early finds of crossbows were discovered in Tomb 138 at Saobatang, Hunan Province, and date to mid-4th century BC. It's possible that these early crossbows used spherical pellets for ammunition. A Western-Han mathematician and music theorist, Jing Fang (78-37 BC), compared the moon to the shape of a round crossbow bullet. Zhuangzi also mentions crossbow bullets. The earliest textual evidence of the handheld crossbow used in battle dates to the 4th century BC. 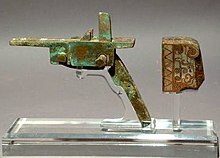 Handheld crossbows with complex bronze trigger mechanisms have also been found with the Terracotta Army in the tomb of Qin Shihuang (r. 221–210 BC) that are similar to specimens from the subsequent Han Dynasty (202 BC–220 AD), while crossbowmen described in the Qin and Han Dynasty learned drill formations, some were even mounted as charioteers and cavalry units, and Han Dynasty writers attributed the success of numerous battles against the Xiongnu and Western Regions states to massed crossbow volleys. The bronze triggers were designed in such a way that they were able to store a large amount of energy within the bow when drawn, but was easily shot with little resistance and recoil when the trigger were pulled. The trigger nut also have a long vertical spine that can be used like a primitive rear sight for elevation adjustment, which allowed precision shooting over longer distances. The metal portions of the crossbow were also mass-produced with precision, with the bronze mechanisms being interchangeable and can be installed by simply dropped into a slot on the tiller frame. Finally, the Qin and Han Dynasties also developed crossbow shooting lines, with alternating rows of crossbowmen shooting and reloading in a manner similar to a musket firing line. The earliest Chinese documents mentioning a crossbow were texts from the 4th to 3rd centuries BC attributed to the followers of Mozi. This source refers to the use of a giant crossbow between the 6th and 5th centuries BC, corresponding to the late Spring and Autumn Period. Sun Tzu's The Art of War (first appearance dated between 500 BC to 300 BC) refers to the characteristics and use of crossbows in chapters 5 and 12 respectively, and compares a drawn crossbow to "might". The Huainanzi advises its readers not to use crossbows in marshland where the surface is soft and it is hard to arm the crossbow with the foot. The Records of the Grand Historian, completed in 94 BC, mentions that Sun Bin defeated Pang Juan by ambushing him with a body of crossbowmen at the Battle of Maling. The Book of Han, finished 111 AD, lists two military treatises on crossbows. It's clear from surviving inventory lists in Gansu and Xinjiang that the crossbow was greatly favored by the Han dynasty. For example in one batch of slips there are only two mentions of bows, but thirty mentions of crossbows. Crossbows were mass-produced in state armories with designs improving as time went on, such as the use of a mulberry wood stock and brass; a crossbow in 1068 could pierce a tree at 140 paces. Crossbows were used in numbers as large as 50,000 starting from the Qin dynasty and upwards of several hundred thousand during the Han. According to one authority, the crossbow had become "nothing less than the standard weapon of the Han armies," by the second century BC. Han soldiers were required to pull a crossbow with a draw weight equivalent of 76kg to qualify as a crossbowman. After the Han dynasty, the crossbow lost favor until it experienced a mild resurgence during the Tang dynasty, under which the ideal expeditionary army of 20,000 included 2,200 archers and 2,000 crossbowmen. Li Jing and Li Quan prescribed 20 percent of the infantry to be armed with crossbows. During the Song dynasty, the government attempted to restrict the spread of crossbows and sought ways to keep armour and crossbows out of civilian homes. Despite the ban on certain types of crossbows, the weapon experienced an upsurge in civilian usage as both a hunting weapon and pastime. The "romantic young people from rich families, and others who had nothing particular to do" formed crossbow shooting clubs as a way to pass time. During the late Ming dynasty, no crossbows were mentioned to have been produced in the three year period from 1619 to 1622. With 21,188,366 taels, the Ming manufactured 25,134 cannons, 8,252 small guns, 6,425 muskets, 4,090 culverins, 98,547 polearms and swords, 26,214 great "horse decapitator" swords, 42,800 bows, 1,000 great axes, 2,284,000 arrows, 180,000 fire arrows, 64,000 bow strings, and hundreds of transport carts. Military crossbows were armed by treading, or basically placing the feet on the bow stave and drawing it using one's arms and back muscles. During the Song dynasty, stirrups were added for ease of drawing and to mitigate damage to the bow. Alternatively the bow could also be drawn by a belt claw attached to the waist, but this was done lying down, as was the case for all large crossbows. Winch-drawing was used for the large mounted crossbows as seen below, but evidence for its use in Chinese hand-crossbows is scant. Other sorts of crossbows also existed, such as the repeating crossbow, multi-shot crossbow, larger field artillery crossbows, and repeating multi-shot crossbow. Wheelmounted and elephantmounted double-bow-arcuballistae of the Champa kingdom. In Vietnamese historical legend, general Thục Phán, who ruled over the ancient kingdom of Âu Lạc from 257 to 207 BC, is said to have owed his power to a magic crossbow, capable of shooting thousands of bolts at once. The native Montagnards of Vietnam's Central Highlands were also known to have used crossbows, as both a tool for hunting, and later, an effective weapon against the Viet Cong during the Vietnam War. Montagnard fighters armed with crossbows proved a highly valuable asset to the US Special Forces operating in Vietnam, and it was not uncommon for the Green Berets to integrate Montagnard crossbowmen into their strike teams. Crossbow technology for multi-proded crossbows was transferred from the Chinese to Champa, which Champa used in its invasion of the Khmer Empire's Angkor in 1177. China transferred crossbow technology to Champa. 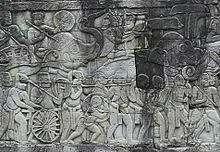 When the Chams sacked Angkor they used the Chinese siege crossbow. Crossbows were given to the Chams by China. Crossbows and archery while mounted were instructed to the Cham by a Chinese in 1171. The earliest crossbow-like weapons in Europe probably emerged around the late 5th century BC when the gastraphetes, an ancient Greek crossbow, appeared. The device was described by the Greek author Heron of Alexandria in his Belopoeica ("On Catapult-making"), which draws on an earlier account of his compatriot engineer Ctesibius (fl. 285–222 BC). According to Heron, the gastraphetes was the forerunner of the later catapult, which places its invention some unknown time prior to 399 BC. The gastraphetes was a crossbow mounted on a stock divided into a lower and upper section. The lower was a case fixed to the bow while the upper was a slider which had the same dimensions as the case. Meaning "belly-bow", it was called as such because the concave withdrawal rest at one end of the stock was placed against the stomach of the operator, which he could press to withdraw the slider before attaching a string to the trigger and loading the bolt; this could thus store more energy than regular Greek bows. It was used in the Siege of Motya in 397 BC. This was a key Carthaginian stronghold in Sicily, as described in the 1st century AD by Heron of Alexandria in his book Belopoeica. Other arrow shooting machines such as the larger ballista and smaller Scorpio also existed starting from around 338 BC, but these are torsion catapults and not considered crossbows. 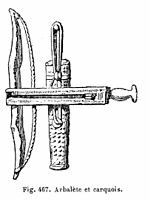 Arrow-shooting machines (katapeltai) are briefly mentioned by Aeneas Tacticus in his treatise on siegecraft written around 350 BC. An Athenian inventory from 330–329 BC includes catapults bolts with heads and flights. Arrow-shooting machines in action are reported from Philip II's siege of Perinthos in Thrace in 340 BC. At the same time, Greek fortifications began to feature high towers with shuttered windows in the top, presumably to house anti-personnel arrow shooters, as in Aigosthena. A crossbow based on depictions from a Roman grave in Gaul. The late 4th century author Vegetius provides the only contemporary account of ancient Roman crossbows. In his De Re Militaris, he describes arcubalistarii (crossbowmen) working together with archers and artillerymen. However it is disputed if arcuballistas were even crossbows or just more torsion powered weapons. The idea that the arcuballista was a crossbow is based on the fact that Vegetius refers to it and the manuballista, which was torsion powered, separately. Therefore if the arcuballista was not like the manuballista, it may have been a crossbow. Some suggest it was the other way around and manuballistas were crossbows. The etymology is not clear and their definitions obscure. According to Vegetius, these were well known devices, and as such didn't make the effort to describe them in depth. On the textual side, there is almost nothing but passing references in the military historian Vegetius (fl. + 386) to 'manuballistae' and 'arcuballistae' which he said he must decline to describe as they were so well known. His decision was highly regrettable, as no other author of the time makes any mention of them at all. Perhaps the best supposition is that the crossbow was primarily known in late European antiquity as a hunting weapon, and received only local use in certain units of the armies of Theodosius I, with which Vegetius happened to be acquainted. Arrian's earlier Ars Tactica, written around 136 AD, does mention 'missiles shot not from a bow but from a machine' and that this machine was used on horseback while in full gallop. It's presumed that this was a crossbow. The only pictorial evidence of Roman arcuballistas comes from sculptural reliefs in Roman Gaul depicting them in hunting scenes. These are aesthetically similar to both the Greek and Chinese crossbows, but it's not clear what kind of release mechanism they used. Archaeological evidence suggests they were based on the rolling nut mechanism of medieval Europe. References to the crossbow are basically nonexistent in Europe from the 5th century until the 10th century. There is however a depiction of a crossbow as a hunting weapon on four Pictish stones from early medieval Scotland (6th to 9th centuries): St. Vigeans no. 1, Glenferness, Shandwick, and Meigle. The crossbow reappeared again in 947 as a French weapon during the siege of Senlis and again in 984 at the siege of Verdun. They were used at the battle of Hastings in 1066 and by the 12th century it had become a common battlefield weapon. 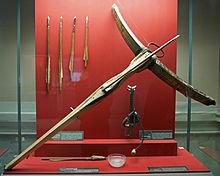 The earliest extant European crossbow remains to date were found at Lake Paladru and has been dated to the 11th century. The crossbow superseded hand bows in many European armies during the 12th century, except in England, where the longbow was more popular. Later crossbows (sometimes referred to as arbalests), utilizing all-steel prods, were able to achieve power close (and sometime superior) to longbows, but were more expensive to produce and slower to reload because they required the aid of mechanical devices such as the cranequin or windlass to draw back their extremely heavy bows. Usually these could only shoot two bolts per minute versus twelve or more with a skilled archer, often necessitating the use of a pavise to protect the operator from enemy fire. Along with polearm weapons made from farming equipment, the crossbow was also a weapon of choice for insurgent peasants such as the Taborites. Genoese crossbowmen were famous mercenaries hired throughout medieval Europe, while the crossbow also played an important role in anti-personnel defense of ships. Crossbows were eventually replaced in warfare by gunpowder weapons, although early guns had slower rates of fire and much worse accuracy than contemporary crossbows. The Battle of Cerignola in 1503 was largely won by Spain through the use of matchlock firearms, marking the first time a major battle was won through the use of firearms. Later, similar competing tactics would feature harquebusiers or musketeers in formation with pikemen, pitted against cavalry firing pistols or carbines. While the military crossbow had largely been supplanted by firearms on the battlefield by 1525, the sporting crossbow in various forms remained a popular hunting weapon in Europe until the eighteenth century. There are no references to crossbows in Islamic texts earlier than the 14th century. Arabs in general were averse to the crossbow and considered it a foreign weapon. They called it qaus al-rijl (foot-drawn bow), qaus al-zanbūrak (bolt bow) and qaus al-faranjīyah (Frankish bow). Although Muslims did have crossbows, there seems to be a split between eastern and western types. Muslims in Spain used the typical European trigger while eastern Muslim crossbows had a more complex trigger mechanism. In Western Africa and Central Africa, crossbows served as a scouting weapon and for hunting, with African slaves bringing this technology to natives in America. In the US South, the crossbow was used for hunting and warfare when firearms or gunpowder were unavailable because of economic hardships or isolation. In the North of Northern America, light hunting crossbows were traditionally used by the Inuit. [non-tertiary source needed] These are technologically similar to the African derived crossbows, but have a different route of influence. The French, and the British used a Sauterelle (French for grasshopper) in World War I. It was lighter and more portable than the Leach Trench Catapult, but less powerful. It weighed 24 kg (53 lb) and could throw an F1 grenade or Mills bomb 110–140 m (120–150 yd). The Sauterelle replaced the Leach Catapult in British service and was in turn replaced in 1916 by the 2 inch Medium Trench Mortar and Stokes mortar. Fisheries scientist obtaining tissue samples from dolphins swimming in the bow wave of a NOAA ship (2010). A whale shot by a modified crossbow bolt for a blubber biopsy sample. Crossbows are used for shooting sports and bowhunting in modern archery and for blubber biopsy samples in scientific research. In some countries such as Canada or the United Kingdom, they may be less heavily regulated than firearms, and thus more popular for hunting; some jurisdictions have bow and/or crossbow only seasons. In modern times, crossbows are no longer used for assassinations, but there are still some applications. 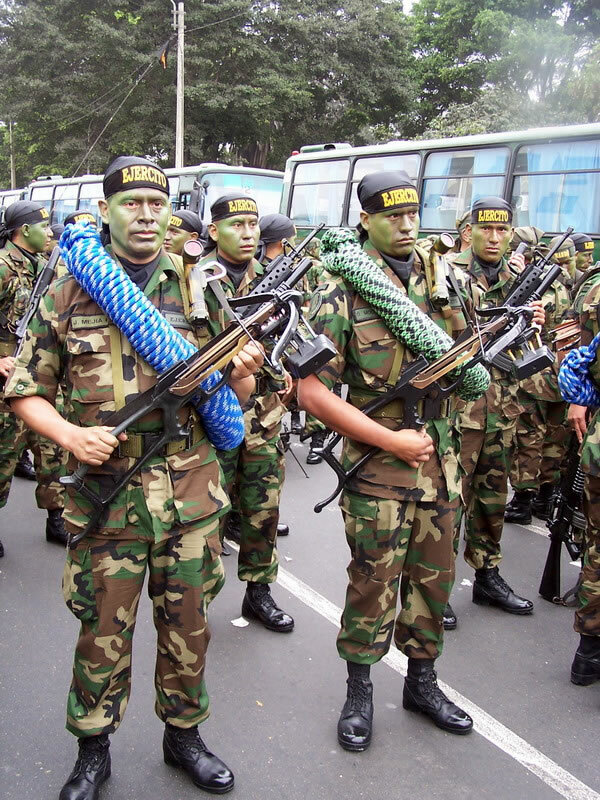 For example, in the Americas, the Peruvian army (Ejército) equips some soldiers with crossbows and rope, to establish a zip-line in difficult terrain. In Brazil the CIGS (Jungle Warfare Training Center) also trains soldiers in the use of crossbows. In the United States of America, SAA International Ltd manufacture a 150 ft·lb crossbow-launched version of the U.S. Army type classified Launched Grapnel Hook (LGH), among other mine countermeasure solutions designed for the middle-eastern theatre. It has been successfully evaluated in Cambodia and Bosnia. It is used to probe for and detonate tripwire initiated mines and booby traps at up to 50 meters. The concept is similar to the LGH device originally only fired from a rifle, as a plastic retrieval line is attached. Reusable up to 20 times, the line can be reeled back in without exposing oneself. The device is of particular use in tactical situations where noise discipline is important. In Europe, British-based Barnett International supplied crossbows to Serbian forces which according to The Guardian were later used "in ambushes and as a counter-sniper weapon", against the Kosovo Liberation Army during the Kosovo War in the areas of Pec and Djakovica, south west of Kosovo. Whitehall launched an investigation, though the department of trade and industry established that not being "on the military list" crossbows were not covered by such export regulations. Paul Beaver of Jane's defence publications commented that, "They are not only a silent killer, they also have a psychological effect". On 15 February 2008, Serbian Minister of Defence Dragan Sutanovac was pictured testing a Barnett crossbow during a public exercise of the Serbian army's Special Forces in Nis, 200 km south of capital Belgrade. 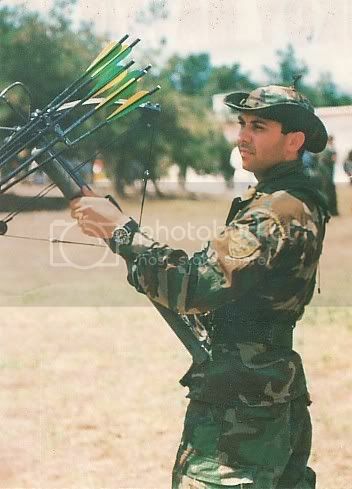 Special forces in both Greece and Turkey also continue to employ the crossbow. Spain's Green Berets still use the crossbow as well. In Asia, some Chinese armed forces use crossbows, including the special force Snow Leopard Commando Unit of the People's Armed Police and the People's Liberation Army. One justification for this comes in the crossbow's ability to stop persons carrying explosives without risk of causing detonation. During the Xinjiang riots of July 2009, crossbows were used alongside modern military hardware to quell protests. The Indian Navy's Marine Commando Force were equipped until the late 1980s with crossbows supplied with cyanide-tipped bolts, as an alternative to suppressed handguns. With a crossbow, archers could release a draw force far in excess of what they could have handled with a bow. Furthermore, the crossbow could hold the tension for a long time, whereas even the strongest longbowman could only hold a drawn bow for a short period of time. The ease of use of a crossbow allows it to be used effectively with little training, while other types of bows take far more skill to shoot accurately. The disadvantage is the greater weight and clumsiness to reload compared to a bow, as well as the slower rate of shooting and the lower efficiency of the acceleration system, but there would be reduced elastic hysteresis, making the crossbow a more accurate weapon. Crossbows have a much smaller draw length than bows. This means that for the same energy to be imparted to the arrow (or bolt), the crossbow has to have a much higher draw weight. A direct comparison between a fast hand-drawn replica crossbow and a longbow show a 6:10 rate of shooting or a 4:9 rate within 30 seconds and comparable weapons. Can. 29 of the Second Lateran Council under Pope Innocent II in 1139 banned the use of crossbows, as well as slings and bows, against Christians. Today, the crossbow often has a complicated legal status due to the possibility of lethal use and its similarities to both firearms and archery weapons. While some jurisdictions regard crossbows the same as firearms, many others do not require any sort of license to own a crossbow. The legality of using a crossbow for hunting varies widely around the world, and even within different jurisdictions of some federal countries. For example, in Canada a valid licence or registration certificate is not needed to possess any other type of bow, including a crossbow that is longer than 500 mm and that requires the use of both hands. ^ Tom Ukinski (23 May 2013). "Drones: Mankind's Always Had Them". Guardian Liberty Voice. Retrieved 1 March 2015. ^ "Facts and interesting information about Medieval Weapons, Armor and arms, specifically, the Crossbow". medieval-life-and-times.info. Retrieved 1 March 2015. ^ a b c d e f g h i j k l m n o p q r s Loades 2018. ^ Needham 1994, p. 133. ^ a b c Needham 1994, p. 150. ^ Ixax, belle. "Crossbow Reviews 2017". Archer's Café. Retrieved 9 March 2017. ^ a b Bolts and Arrows: The Lighter Side of Hunting Projectile Name Calling. Foremosthunting.com. Retrieved on 24 June 2011. ^ "Sighting a Crossbow". Best Crossbow Source. Retrieved 28 October 2014. ^ "Crossbow". reference.com. Columbia University Press. Archived from the original on 2 April 2015. Retrieved 1 March 2015. ^ A Crossbow Mechanism with Some Unique Features from Shandong, China. Asian Traditional Archery Research Network. Retrieved on 2008-08-20. ^ Wagner, Donald B. (1993). Iron and Steel in Ancient China: Second Impression, With Corrections. Leiden: E.J. Brill. ISBN 90-04-09632-9. pp. 153, 157–158. ^ Needham, Joseph (1986). Science and Civilization in China: Volume 3, Mathematics and the Sciences of the Heavens and the Earth. Taipei: Caves Books Ltd, p. 227. ^ Needham 1994, p. 89. ^ Needham (1986), Volume 5, Part 6, 124–128. ^ Needham 1994, p. 34. ^ a b Needham 1994, p. 141. ^ Needham 1994, p. 139. ^ Needham 1994, p. 22. ^ Needham 1994, p. 143. ^ Graff 2002, p. 22. ^ Graff 2002, p. 193. ^ Graff 2016, p. 52. ^ Needham 1994, p. 145. ^ Needham 1994, p. 146. ^ Swope 2014, p. 49. ^ "Montagnard Crossbow, Vietnam". awm.gov.au. Australian War Memorial. Retrieved 4 February 2019. ^ R. G. Grant (2005). Battle: A Visual Journey Through 5,000 Years of Combat. DK Pub. p. 100. ISBN 978-0-7566-1360-0. ^ Stephen Turnbull (20 August 2012). Siege Weapons of the Far East (1): AD 612-1300. Osprey Publishing Limited. pp. 42–. ISBN 978-1-78200-225-3. ^ Stephen Turnbull (20 August 2012). Siege Weapons of the Far East (1): AD 612–1300. Bloomsbury Publishing. pp. –. ISBN 978-1-78200-225-3. ^ Joseph Needham; Ling Wang; Robin D. S. Yates; Gwei-Djen Lu; Ping-Yü Ho (1994). Science and Civilisation in China: Vol. 5, Chemistry and chemical technology ; Pt. 6, Military technology : missiles and sieges. Cambridge University Press. pp. 145–. ISBN 978-0-521-32727-5. ^ Campbell 2003, pp. 3ff. ^ a b DeVries, Kelly Robert. (2003). Medieval Military Technology. Petersborough: Broadview Press. ISBN 0-921149-74-3. Page 127. ^ DeVries, Kelly Robert. (2003). Medieval Military Technology. Petersborough: Broadview Press. ISBN 0-921149-74-3. Page 128. ^ a b Duncan Campbell: Greek and Roman Artillery 399 BC-AD 363, Osprey Publishing, Oxford 2003, ISBN 1-84176-634-8, p.8ff. ^ a b Needham 1994, p. 172. ^ John M. Gilbert, Hunting and Hunting Reserves in Medieval Scotland (Edinburgh: John Donald, 1979), p. 62. ^ Needham 1994, p. 170. ^ Needham 1994, p. 175. ^ Baaka pygmy with crossbow. Photographersdirect.com. Retrieved on 24 June 2011. ^ a b Notes On West African Crossbow Technology. Diaspora.uiuc.edu. Retrieved on 24 June 2011. ^ Hunting Network (10 February 2009). "The Crossbow: Four thousand years of traditional archery". bowhunting.com. Retrieved 1 March 2015. ^ "The Royal Engineers". The Royal Engineers Journal. The Institution of Royal Engineers. 39: 79. 1925. ^ Hugh Chisholm (1922). The Encyclopædia Britannica: The New Volumes, Constituting, in Combination with the Twenty-nine Volumes of the Eleventh Edition, the Twelfth Edition of that Work, and Also Supplying a New, Distinctive, and Independent Library of Reference Dealing with Events and Developments of the Period 1910 to 1921 Inclusive, Volume 1. Encyclopædia Britannica Company Limited. p. 470. ^ Jane's LGH Mine Clearance by US forces Jul 2009. Janes.com (9 June 2011). Retrieved on 24 June 2011. ^ LGH Plastic Retrieval Line. None. Retrieved on 24 June 2011. ^ SAA Crossbow Launched Grapnel Hook Archived 15 July 2011 at the Wayback Machine. Saa-intl.com. Retrieved on 24 June 2011. ^ Day Life Serbia report Archived 12 January 2009 at the Wayback Machine. Daylife.com (15 February 2008). Retrieved on 24 June 2011. ^ Greek soldiers uses crossbow. 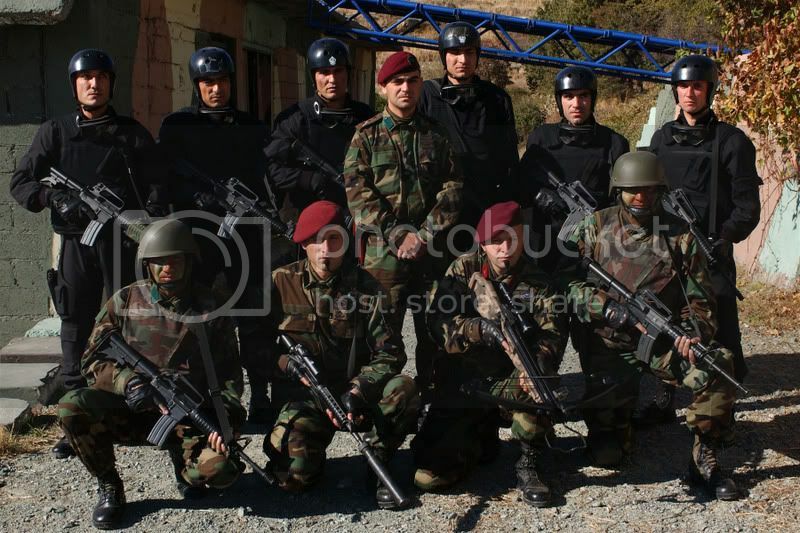 ^ Spanish Green Beret 2005 photo. ^ Bingham, John. (9 July 2009) "Xinjiang riots: Modern Chinese army displays ancient preference for crossbow". Daily Telegraph (UK). Retrieved on 24 June 2011. ^ "These Are The Pros and Cons of Crossbow Hunting". Wide Open Spaces. 1 September 2016. Retrieved 11 January 2018. ^ Police, Government of Canada, Royal Canadian Mounted; Canada, Gouvernement du Canada, Gendarmerie royale du. "Language selection - Royal Canadian Mounted Police". Baatz, Dietwulf (1994). "Die römische Jagdarmbrust". Bauten und Katapulte des römischen Heeres. Stuttgart: Franz Steiner Verlag. pp. 284–293. ISBN 3-515-06566-0. Graff, David A. (2002). Medieval Chinese Warfare, 300-900. Warfare and History. London, England: Routledge. ISBN 0415239559. Payne-Gallwey, Ralph, Sir, The Crossbow: Mediaeval and Modern, Military and Sporting; its Construction, History & Management with a Treatise on the Balista and Catapult of the Ancients and An Appendix on the Catapult, Balista & the Turkish Bow, New York : Bramhall House, 1958. Wikimedia Commons has media related to Crossbows. 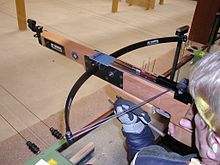 Look up crossbow in Wiktionary, the free dictionary.